Beautiful addition to my collection, very pleased with product and customer service! Brother Drew is top notch!! If you don't own one of these jewels I highly suggest purchasing one! Thanks Brother! Drew, Thank you so much for this beautiful piece. I wear it everyday. I just received this piece, and I love it! It really is a work of art! The picture can't truly reveal the workmanship of this pendant. Thank you so much, Drew! This is a great piece and an honor to wear. The picture does not capture the character of this jewel. The customer service was unbelievable and Bro. Drew is a great example of the tenets of Masonry. 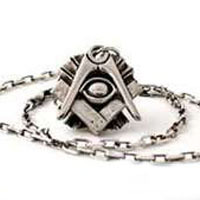 I have received multiple compliments from Masons and non Masons alike. Quality, Service, Square Dealing are all encompassed in the work of a true artist.